Gucci Guilty Eau is an evolution of the Gucci Guilty fragrance universe. 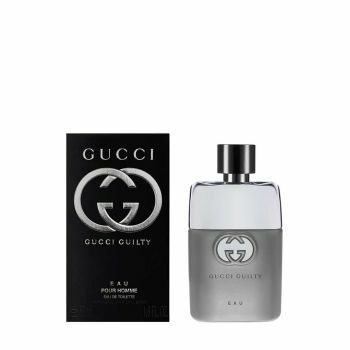 A smooth and light interpretation of the classic Guilty women’s and men’s fragrances, Gucci Guilty Eau breaks with the tradition of sparkling, cool eau de toilettes, conveying a more delicate, romantic attitude. Guilty Eau for him creates a heady contrasting aromatic blend of lemon and bergamot top notes with noble woody orris, bringing an intriguing infusion to the orange blossom signature of the original scent. At the base, a suave patchouli and musk blend creates the scent’s timbre. The Design: Highly tactile, the bottles combine satiné and shiny finishes, shaping a captivating new look for Gucci Guilty Eau. The black outer packaging is illuminated by Gucci’s iconic interlocking Gs in gold and gunmetal.